Apple's first retail store in Glendale, Calif., has attained cult status, as passionate fans of the company frequent the site solely because of its status as Apple Store No. 1. 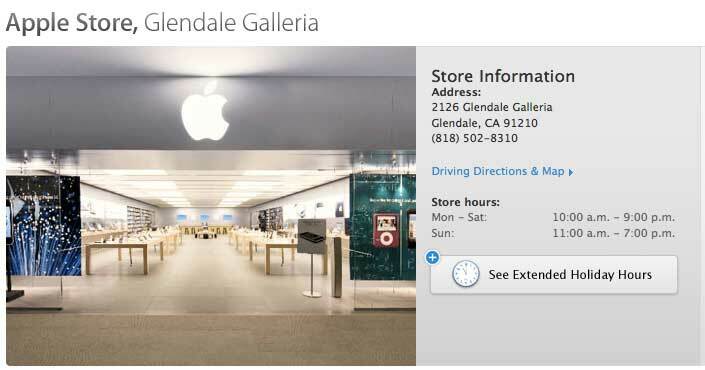 The Apple Store at Glendale Galleria actually opened the same day as another store in Virginia, but the Glendale store is listed as the first in Apple's rankings. As profiled by Reuters, the "unassuming" and "uncool" location still attracts attention from fans of the Mac maker. "Some visitors return home and brag online about purchasing gear at the Glendale branch, part of a vigorous game of one-upsmanship about the number and quality of the Apple stores they have visited," author Sarah McBride wrote. She continued: "To find the Glendale store, customers navigate past a crowded food court, ascend a run-of-the-mill escalator, and search out the familiar silver Apple among neighbors like a discount men's suit shop and a teen-fashion retailer." That's a stark contrast from Apple's latest flagship megastore in Shanghai, which has a giant cylindrical glass entrance housing stairs that take visitors down to the store below ground. And Apple's Fifth Avenue location in Manhattan is the most profitable store in the district. Because of the store's distinction as the first Apple retail outlet, employees also reportedly request transfers from other stores so they can work in Glendale. And some customers also said the employees at the Glendale store seem more knowledgable about the products because of it. The first Apple stores opened on May 19, 2001 in McLean, Virginia, at the Tyson's Corner Mall, as well as the Galleria store in Glendale. The retail side of Apple's business has become an important part of the growth of the Mac, as the company reports every quarter that about half of all Macs sold in retail stores are to customers who never owned a Mac before.